In 2013, six government departments made a total of 1,956 pieces of content removal requests to local service providers. The Drug Office of the Department of Health topped the request list with 1,321 requests made in order to remove hyperlinks which contain information on suspected auction or sale of controlled or unregistered medicines. It is followed by Customs and Excise Department’s 391 requests to remove webpages, accounts, or hyperlinks on infringement offence. Aside from the police force, all the other five departments have their requests acceded to by service providers. The police told HKTR that they don’t know how many of their requests were fulfilled as some of the service providers did not reply to their data removal requests. Four departments, namely Chinese Medicine Division, Drug Office, Office of the Communications Authority and Post Office have provided the number of service providers they made requests to in 2013. In particular, Office of the Communications Authority revealed the name of one of the websites which the authority asked to remove indecent text and photos, while the other departments did not disclose the names of the service providers due to legal or operational restrictions. Five out of the six departments have disclosed the number of users or accounts affected by their content removal requests. Drug Office told HKTR it does not keep a record of the accounts affected and therefore cannot provide such information. 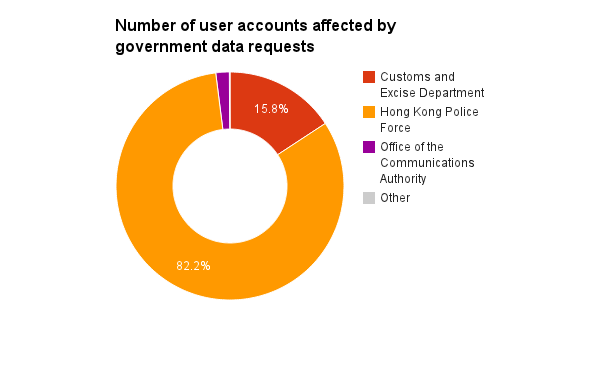 Data source: government release and information obtained by HKTR from government access to information officers.